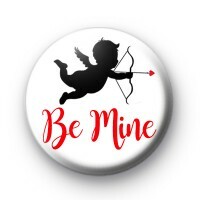 This is a white 1 inch button badge with the words Be Mine in red font and also a picture of cupid firing a love arrow. Cupid is the symbol of love and this simple badge would make an inexpensive handmade gift this Valentines Day, for the one you love. All our button badges are handmade in the UK (with love).